That all animals should be treated with respect and kindness. Training should use gentle methods and positive reinforcement. Training should be fun, and a journey the entire family should enjoy towards having a wonderful family companion for years to come. It's Here! 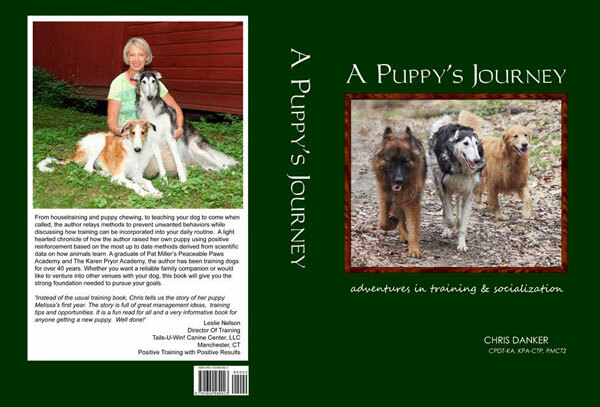 "A Puppy's Journey, adventures in training & socialization"
The new book by Chris can be ordered here. "Instead of the usual training book, Chris tells us the story of her puppy Melissa's first year. The story is full of great management ideas, training tips and opportunities. It is a fun read for all and a very informative book for anyone getting a new puppy. Well done". Copyright Hemlock Hollow Dog Training, LCC. 2009 No images or content may be used without permission.